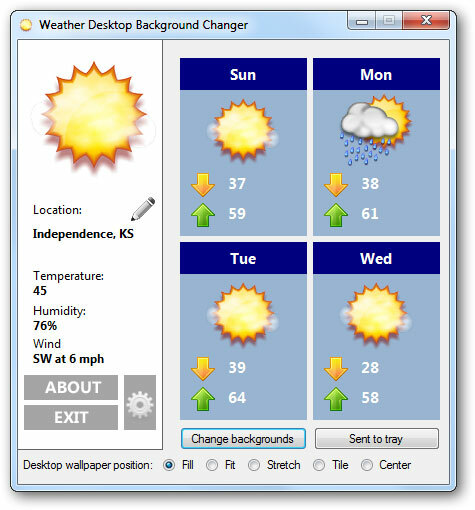 Weather Desktop Background Changer is a free portable tool for Windows 7 that automatically changes your desktop wallpaper according to the weather. Just run the tool, click the Pencil icon to select your location and it will automatically change your desktop wallpaper according to the weather of your location to the default wallpaper package which it has. To change the default desktop wallpapers click Change Backgrounds and change your desired desktop wallpaper. It will check the weather every 1 minute so to change this click the Gear icon.